New climate change legislation championed by the Citizens’ Climate Lobby and introduced by three Democrats and two Republicans is a reasonable approach. We need to support it, call our representatives about it and talk about it with our neighbors. You have to admire the audacity of the four volunteers from Citizens’ Climate Lobby (CCL) who recently completed a “Climate Conversation Tour” of North Dakota. This is a deep red state; 63 percent of voters here cast their ballots for Donald Trump in 2016. And Trump is the world’s most devout fossil fuel apostle, its greatest denier of human-caused global warming. “I don’t believe it,” he infamously said a couple of weeks ago when the Fourth National Climate Assessment produced by 13 U.S. federal agencies provided a dire assessment for the United States. “The report found that climate change will cost the US hundreds of billions of dollars annually and damage health,” the BBC reported. Even so, the CCL volunteers – Paul Thompson and Mindy Ahler from the CCL’s North Wind Region and Brad and Linda Kingery from the Bemidji, Minn. chapter – came to North Dakota for six events in four communities to spur discussion about climate change and let people know about Citizens’ Climate Lobby’s efforts. Their “climate conversations” are both welcome and necessary. North Dakotans, like everyone else in the nation, need to start talking about man-made global warming and climate change and how to address them. We need to take action to curb human activities that have created the crisis and are making it worse. We need to do it together. And we need to do it right now. 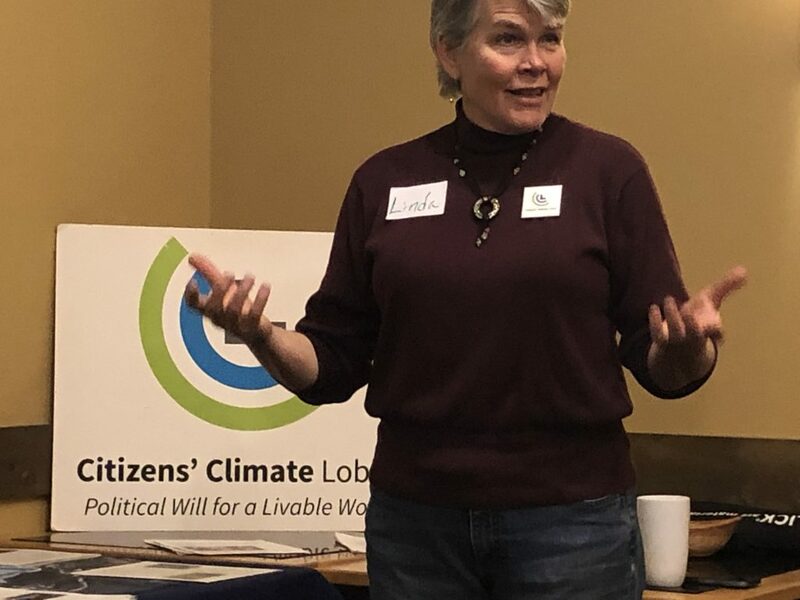 Linda Kingery of the Citizens’ Climate Lobby chapter in Bemidji, Minn. discusses climate change during a “Climate Conversation Tour” event in Fargo, N.D.
To Believe or Disbelieve. With Climate Change, That is No Longer the Question. Too many people still talk about whether they or others believe or don’t believe in global warming and climate change caused by humans. That misdirected conversation is over. “Believe” or “disbelieve” is the wrong way to talk about these issues, anyway. It’s not that more than 97 percent of the world’s climate scientists believe in man-made climate change, it’s that more than 97 percent accept the observable data regarding how the climate is changing, how quickly and how severe the effects on our planet are and will be. And just to be clear, “consensus” means “general agreement”; it has never meant 100 percent agreement. Besides, my guess is the other 3 percent is climate scientists employed by fossil fuel extraction companies. Even with that consensus, there is no one-and-done “solution.” We cannot “solve” the effects of man-made climate change. Scientists are already saying some of the negative consequences of damage already done will continue for decades, possibly even centuries. However, we can limit the amount of carbon and other dangerous gasses being emitted into the atmosphere, slow emissions down and, ultimately, phase them out entirely. To do that, we need a reasonable and doable approach to curbing human activities that are causing global temperatures to rise to dangerous, even catastrophic, levels. The CCLers not only came to kick-start conversations about global warming and climate change among North Dakotans, regardless of their level of acceptance of the scientific data, but also to talk about a bi-partisan approach to limiting human impacts moving forward. Last week, three Democrats and two Republicans introduced H.R. 7173, the “Energy Innovation and Carbon Dividend Act,” in the U.S. House of Representatives. Companies or organizations that emit harmful gasses into the atmosphere will pay a fee for doing so. The fee will increase year over year to encourage them to invest in new technologies and equipment that reduce their emissions. The fees will go into a Carbon Dividend Trust Fund, from which every U.S. citizen will receive carbon dividend payments. There’s much more to it, of course, and I encourage you to read the bill. either support it or, at the least, do not obstruct its progress. The Energy Innovation and Carbon Dividend Act is a reasonable approach, one that could impact the projections in future national climate assessments. CCL has been advocating for this type of approach for many years. During that time, it’s also been building a Citizens Climate Caucus in the U.S. House of Representatives with members from both parties who are prepared to take action on global warming and climate change. To date, the ratio of Republicans to Democrats has been 1-to-1 ratio. CCL continues to push for positive action, bring people together and, as its tagline says, build “Political Will for a Livable World.” Its volunteers have the courage to push the discussion to more people in more places. We can have the audacity, too. Watch for the reintroduction, contact your representatives to make sure they either support it or, at the least, do not obstruct its progress, and talk to your neighbors. Our climate conversations will make the difference.